Brake rotors serve as metal discs attached to a vehicle’s axles. Pushing the brake pedal also results to the brake pads pressing the rotor, further leading to the creation of friction, forcing the wheels to turn slowly. Such friction, however, also results to a worn out disc that may require resurfacing. Aside from that, there is also a risk that you will need to replace the brake rotors soon because of excessive wear and damage below a certain limit. The need for replacement can usually be determined based on the number of miles driven, as well as your driving conditions – ex. road salt, rocks, sand, dirt, and heat. If there is a need for you to replace your brake rotor, then here are five of the best brake rotors 2018 that you ought to consider. They are considered as the best choices as they have high satisfaction ratings plus the most remarkable features integrated into the product. One thing that you will notice about the 18A925A Advantage front disc brake rotor from ACDelco is its ability to offer a highly reliable and efficient braking power. It comes with an application specific vane configuration, which is guaranteed to increase its capacity to offer safety and improve its performance. Such configuration is also a big help in dampening both vibration and noise, plus maximizing airflow, thereby keeping the rotor cool. However, despite the fact that this brake rotor from ACDelco has a lot of promise regarding features and performance, it also has a few drawbacks. One such problem is the fit. There are those who reported that it is not the right rotor for their vehicle, despite the label saying it was. This is the reason why it is advisable to check first whether the size is the perfect fit by checking what Amazon says about it. Another drawback is the fact that the brake rotor is not corrosion-resistant. Furthermore, it tends to create some squeaky noise when used. Still, it is one of those brake rotors that can give you real value for your money. Aside from the features initially mentioned, it also has a non-directional ground finish, which is a huge help in minimizing thickness variation and extending the life of the brake pad. The fact that its manufacturer sells it at an affordable price is also a bonus. 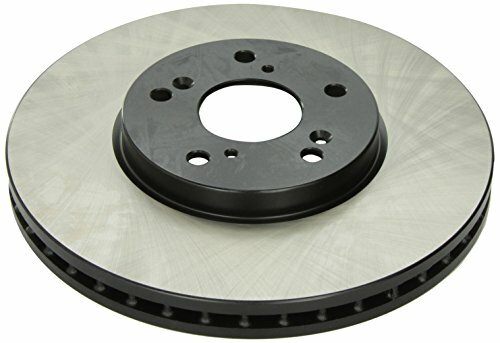 ACDelco 18A925A Advantage Front Disc Brake Rotor also comes with several alloys that aid in improving the dissipation of heat as well as the product’s performance. 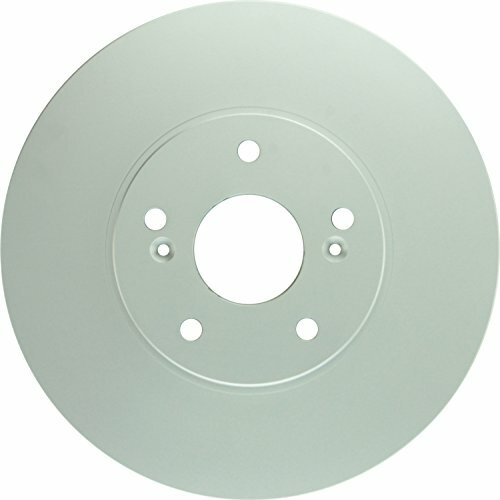 Bosch 26010733 QuietCast Premium Disc Brake Rotor from Bosch makes use of high quality and innovative materials, thereby ensuring that it will perform well once used. It is ideal for modern, open-wheeled vehicles with its ability to offer such with a cleaner look. It also has a feature designed to prevent corrosion and rust. This is possible with its clear coating protection. It has a hundred percent precision and promotes a smoother operation. But just like other brake rotors from famous brands, this one also comes with its set of flaws. One is the fact that it tends to create some noise during the first few times you use it after installation. Rest assured, though, that this noise will go away after some time. Also, there is a need for you to drive slowly and ride the brake for several times to remove the coating found on the surfaces where it has been in contact. Note that such coating will also add up to the noise produced by the product until it is no longer present in the pads that it rubs. There is no need to worry, though, as those flaws are just minor that often come with the first few uses. After some time, you will start to enjoy using it because of its main features. For one, it comes with a factory-engraved edge, which also features a code and minimal thickness specifications. Another thing that makes this brake rotor remarkable is its well-balanced precision. This feature provides an assurance that the rotor will operate smoothly without the risk of pedal pulsation. The OEM style vane configuration used in the product can also produce a more efficient dissipation of heat. This further aids in reducing the risk of vibration triggering more noise while also extending the life of the rotor. The Wagner BD125654E Premium E-Coated Brake Rotor is made from the famous manufacturer Wagner, so you have some sort of assurance that its manufacturer created it in such a way that it can deliver a high level of performance. One of its most remarkable features is its e-shield protective coating, and you will notice that it is extremely useful in all non-braking surfaces. As for its drawback, expect to find a few as you can’t expect all brake rotors to be perfect. One is that it does not seem to fit as expected on some vehicles. It is mainly because of its poor cataloging. Furthermore, you can’t expect this product to be as thick as factory brake rotors, which is also one of its drawbacks. Still, rest assured that the problem is manageable and can be overpowered by its many strong features. The turned surface of the brake rotor, for instance, features a smooth finish, which is a huge help in providing the right amount of friction while also reducing the amount of time needed to break in the rotor. Moreover, it features a unique and patented vane design and configuration, providing it with higher cooling ability. This feature also ensures its more efficient stopping power. The brake rotor also features functional rib designs – all of which are helpful in controlling harshness, vibration as well noise. The result is a smoother and noise-free braking. You can also expect safe stopping power from this brake motor because of the higher surface area, which is helpful for improving the dissipation of heat. This product is another of the most functional brake rotors offered by ACDelco. The fact that it is constructed with several alloys gives it an edge over the other brake rotors in the market as this aids in improving its ability to dissipate heat. Furthermore, this ensures a much better performance. You can also expect its top-notch quality to be useful for appropriate metallurgy. Expect this rotor to come with the right brake plate thickness, as well. However, just like other products in various categories, it is not perfect, which is the reason why it also has its share of drawbacks. One is that you may notice a few shallow surface cracks in the molten metal if you remove the plastic from it to spray clean it. Note, however, that this could be more of a cosmetic issue, which will not hamper the rotor’s overall performance. The plates are not also as thick as the ones offered by Bendix. Packaging is subpar, as well. Still, the quality is good overall. It is mill-balanced, which aids in ensuring that it functions well without the need for extra weights. You can also expect it to be stronger than the others because of its rounded radius. Another thing that you will surely love about this brake rotor is that it does not produce any vibration or squealing sounds when running. This statement means that there will be no annoying sounds just like what the other models produce. It fits nicely and has a high tolerance level. It provides real value for your money, as you can expect to get it at a decent price. Furthermore, you will not have any problems installing it as the entire process is easy. Once installed, expect to enjoy using it as you will never face problems with braking and driving. Centric is one of the leading suppliers and manufacturers of aftermarket brake systems and components for different types of vehicles. That said, you can also expect its Centric 120.40046 Premium Brake Rotor to be highly reliable and to live up to its promise to its clients to provide only top-quality products. One of the things that you will immediately notice in this brake rotor is the fact that it makes use of an Electrocoating finish. With that, it is possible for the product to deliver a long-lasting corrosion protection ability. One issue with this brake rotor from Centric, though, is that linked to its compatibility. You have to get in touch with Amazon or the manufacturer, directly if there are compatibility issues to ensure that their immediate fixing. The rotor is also too thick for some brake calipers, which further add up to its fitting and compatibility issues. The rotor also tends to warp when hot. Furthermore, it does not come with any mounting screws. Despite the mentioned flaws, rest assured that this brake rotor from Centric can deliver what it promises regarding performance. The E-coating finish mentioned earlier, for instance, ensures that its ability to offer correction protection can last long. This coating can refer to an electro-statically implemented finish, which you can expect to handle up to four hundred hours of exposure to saltwater without the risk of developing rust. Furthermore, you will love the double-disc ground integrated into the rotor as it promotes smoother and quieter stops. It has a clean look with its machined finish. ​Brake rotor mainly functions by slowing down your vehicle through the utilization of friction coming from being directly in contact with the brake pads. Noisy brakes – Expect it to produce squeaking or squealing sounds if the rotor is already severely worn or warped. Severely worn rotors often cause scraping sounds while warped ones produce squeaks. Vibrations – These usually come from the brakes. Such is also a sign of excessively worn or warped rotors. You will most likely feel the vibrations on the pedal, and at times, on the chassis. Score marks or grooves – You will also know that you need to replace the rotor if you already notice score marks or grooves on it, which usually results from its repeated contact to the brake pads. The problem with both the score marks and grooves is that they can hamper the ability of the rotor to slow down your vehicle. It can also trigger pulsations and vibrations on the pedal. Fading – This usually happens when you notice that the brake has become unresponsive. It indicates that there is a leak in the system, requiring the replacement. Pulling – This symptom happens when you notice your vehicle pulling to one side each time you apply the brakes. This sign indicates that the brake pads are worn out unevenly, or there is a foreign matter within the brake fluid. All these signs show that the rotors are already damaged, so it is crucial to give it immediate attention. Consider this factor along with how you drive it. Most vehicles come with solid vented rotors. Note, however, that there are also high-performance ones, such as Audi, Mercedes-Benz, and BMW, built with cross-drilled or slotted rotors. You have to keep in mind that each of them requires a different type of rotor, so you have to take this into consideration before making your choice. Look for a rotor designed in such a way that it has enough thickness that allow it to manage more than two pad replacements. This factor is crucial in your search for the best brake rotors as this determines its ability to provide a more secure breaking. Also, note that as the rotor wears out and gets a little thinner, it also tends to have less mass, making it incapable of absorbing and dissipating heat. That said, you need to find a rotor with the right amount of thickness – making it last long. Keep in mind that a brake rotor comes in different types, and you have to be aware of their individual differences if you want to pick the right one. One of its types is the smooth rotor, which is capable of delivering a stopping power, which is more than enough for daily driving. This type also provides an extra surface area, making it highly efficient when it comes to dissipating heat. Another good thing about it is that it is not vulnerable to cracks despite excessive use. The smooth rotor is ideal if you intend to use it for moderate tracks and pair it with performance brake fluids and pads. ​Another type is the slotted rotor, which comes with cut grooves that you can find along the face of the rotor. Heavy braking repeatedly can cause the rotor’s slots to release built-up gasses, which aids in keeping the pads and rotors cooler. It also has a high coefficient of friction, so expect it to consume less energy. Furthermore, it comes with slotted venting designed to prevent the brake from fading while retaining its stopping power. Then there is the cross drilled rotor, which works by efficiently venting built-up dust and gas, thereby keeping its cool. Another thing that this certain type of rotor can do is that it lets water escape from the surface, promoting improved initial pad bite, as well as wet-weather performance. It works well if you intend to use your vehicle on the streets as this prevents your brakes from encountering track-level temperature. Lastly, there is the slotted and drilled rotor. As the name indicates, it combines the functionality and appearance of the cross-drilled and the slotted types. It is ideal for heavy vehicles that tend to tow weighty loads frequently because of its high level of durability and security. You have to study the different types of brake rotors as your knowledge about each one can help you determine which one will fit the needs of your vehicle. This is another vital factor in deciding which among the brake rotors in the market is best for you. If for instance, you frequently use your car for commuting, then there is no need for you to go for the race brakes. Basic and high-quality rotors are often enough for this purpose.However, if it is already loaded with a lot of passengers and gears then installing drilled rotors is a must. If its main use is for towing, drilled or slotted rotors are ideal as these aid in sweeping too much heat. Other purposes that your vehicle may have are for off-roading, street use and performance, and racing. You need to decide how you intend to use it as this is a huge help in figuring out which type and brand perfectly fit your requirements.